Samuel Lionel "Roxy" Rothafel (July 9, 1882 – January 13, 1936) was an American theatrical impresario and entrepreneur. 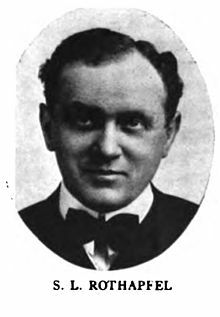 He is noted for developing the lavish presentation of silent films in the deluxe movie palace theaters of the 1910s and 1920s. 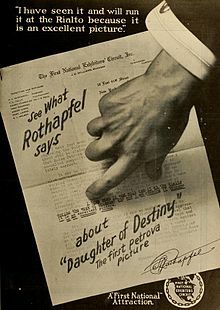 Rothafel (originally Rothapfel, meaning ‘‘Red Apple’’, the modern German spelling is: Rotapfel) was born to a Jewish family in Bromberg, Germany, the son of Cecelia (née Schwerzens) and Gustave Rothapfel. In 1886, his family immigrated to Stillwater, Minnesota. Best known by his nickname, "Roxy", he was the impresario who brought the great New York City movie palaces that he managed to fame and popular success. He began his show business career in Forest City, Pennsylvania, where he created the "Family Theater", a combination cinema and skating rink. In 1912 he came to New York City, where he would achieve his greatest successes. In New York at different times he managed and produced shows at the Regent, Strand, Rialto, Rivoli, and Capitol theaters. His greatest achievement was his eponymous Roxy Theatre at Times Square which opened March 11, 1927. He later opened the Radio City Music Hall and the RKO Roxy (later the Center Theatre) in 1932, his last theatrical project. The Music Hall featured the precision dance troupe the Roxyettes (later renamed The Rockettes), which Rothafel brought with him from the Roxy Theatre. Rothafel has been credited with many movie presentation innovations, including synchronizing orchestral music to movies (in the silent film era) and having multiple projectors to effect seamless reel changes. The book The Best Remaining Seats by Ben M. Hall (1961), gives a good overview of the movie palaces of the 1920s and, specifically, of Roxy himself. Rothafel had health issues in his later life, mainly angina pectoris. He died of a heart attack in his sleep on January 13, 1936 in New York City aged 53. He is buried in Linden Hill Jewish Cemetery in Queens, New York. His wife was Rosa (Freedman), and his daughter, Beta Rothafel, married Lawrence Harold Levy, the son of Samuel Levy, a New York City lawyer, businessman, and public official, who served as Manhattan Borough President. Through Rothafel's granddaughter, Penny (Levy), he is the great-grandfather of actress Amanda Peet. Roxy also made a name for himself on network radio, where he began broadcasting in mid-November 1922. Through 1925, live broadcasts of his weekly variety show Roxy and His Gang from the Capitol Theatre in New York became increasingly popular. 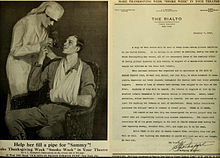 One estimate from 1924 placed his typical radio audience at about five million listeners, and he was said to receive thousands of pieces of fan mail weekly. After Rothafel left the Capitol, his radio show, now known as The Roxy Hour, was broadcast from the new Roxy Theatre on the NBC Blue network from 1927 to 1932. ^ Ken Bloom, Broadway: An Encyclopedia, Routledge, 2013, p. 460. ^ a b "Who was who in America with World Notables - Marquis Who's Who Staff, Marquis Who's Who - Google Books". 2009-03-03. Retrieved 2016-07-03 – via Google Books. ^ Stephenson, William (2000). "Rothafel, Roxy : American National Biography Online - oi". 1. Oxfordindex.oup.com. doi:10.1093/anb/9780198606697.article.1801009. ^ Times Staff (14 January 1936). "S.L. Rothafel dies; 'Roxy' of the threatre". New York Times. p. 21. Retrieved 12 March 2017. ^ [ Displaying Abstract ]. "Charles Peet Jr. And Penny Levy Will Be Married - Lawyer Is the Fiance of '63 Smith Graduate -Bridal in July - Article - NYTimes.com". Select.nytimes.com. Retrieved 2016-07-03. Ken Bloom. Broadway: Its History, People and Places. New York: Routledge, 2004. Ben M. Hall, The Best Remaining Seats; The Story of the Golden Age of the Movie Palace. New York: Clarkson N. Potter, 1961. Ross Melnick, American Showman: Samuel "Roxy" Rothafel and the Birth of the Entertainment Industry, 1908-1935. New York: Columbia University Press, 2012. Ross Melnick. "Station R-O-X-Y: Roxy and the Radio." Film History, vol. 17, # 2/3, 2005, pp. 217–233. Wikimedia Commons has media related to Samuel Roxy Rothafel. This page was last edited on 11 September 2018, at 19:29 (UTC).